How to care your Brazilian hair extension? Home Blog | News Human Hair News How to care your Brazilian hair extension? 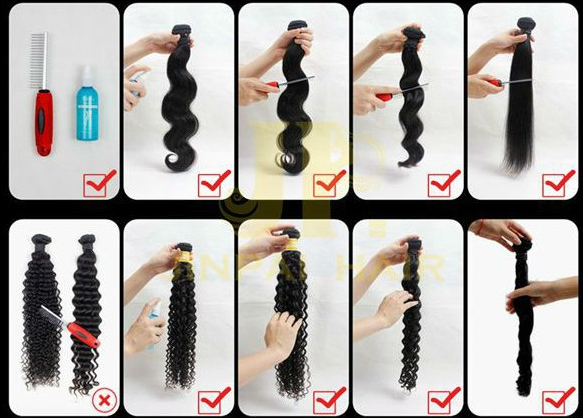 We should treat the hair like our own hair,especially treat 100% human hair extensions.It's very important to take good care of your hair to keep using long time,many customer asked me:"why my hair getting tangle and shed?" Different types of hair need different maintenance. Today,you will know. 2:After waking up,undo braid and comb through beginning at the ends and working your way up to roots. 1:Shampoo at least once a week. 2: Use a shampoo no higher than pH 7. 3: Dilute one ounce of shampoo in a bowl or jug with a pint of warm water. 4:Sponge the shampoo into the hair. 7: Apply conditioner and comb hair, starting with the ends working your way up to your scalp. 11: For extra wave, hair can be set in rollers. 2:Use styling aids, such as mouse, gel, and hairspray in moderation (preferably alcohol free products). 1:Before going to bed, braid your hair into one loose large braid at the back of the neck. 2:After waking up, undo braid. 3: Dampen hair with a water bottle. 4: Comb through beginning at the ends and working your way up to roots. 5:Dilute one ounce of shampoo in a bowl or jug with a pint of warm water. 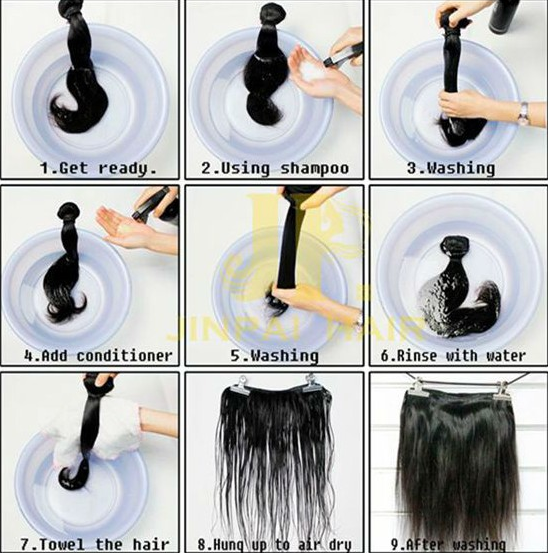 6:Sponge the shampoo into the hair. 9:Apply conditioner and comb hair, starting with the ends working your way up to your scalp. 11:Scrunch up hair gently to reform curl. 1:Brush or comb through to style. 1: Before going to bed, braid your hair into one loose large braid at the back of the neck. 5: Scrunch up hair gently to reform curl.